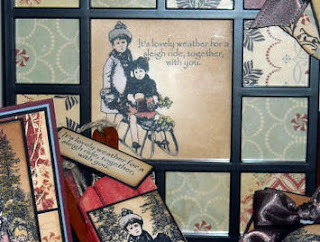 Okay, so it's not really time for a Sleigh Ride, but it is time to get a jump start on holiday cards and gifts! 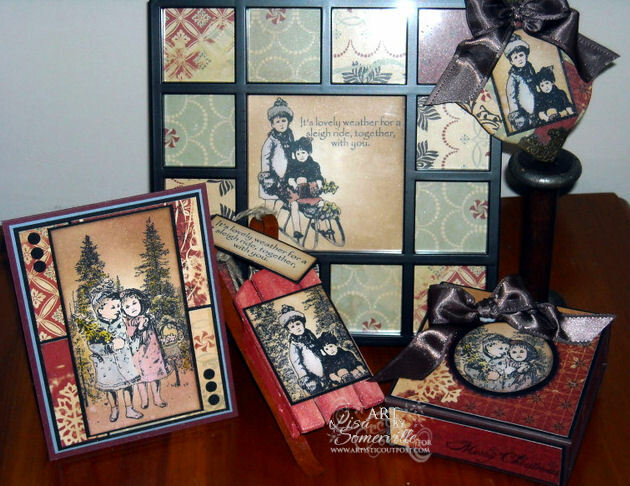 Today, I have some wonderful projects showcasing the Sleigh Ride plate from Artistic Outpost! This set makes wonderful vintage Cards, Ornaments and gifts. Here, I combined the beautiful images with some lovely Cosmo Cricket papers, for Holiday gifts for my family and friends. I'm also excited to share with you that directions for all of these projects can be found in the December 2010 Issue of Crafts 'n Things on pages 62-63. In this issue, you'll find hand-crafted holiday cards and gifts, quick-and-clever ornaments and dazzling décor ideas. Be sure to check out the Budget-Savvy Gifts section for a dozen handmade gift ideas that fit your budget and don't scrimp on style. Love decorating for the holidays? In this issue, you'll discover the secrets to creating sophisticated holiday décor on a shoestring. What a wonderful project! I am in love w/ that frame!!!! Congrats on getting your project published!!!! So worthy of being in a mag!!!! This is exactly the type of thing I like to see in mags! So love the vintage feel of your gorgeous pieces! Beautiful! I have got to get that magazine!! Enjoy your day! Fabulous projects, and congrats on having them published, they so deserve to be! Love the images and the feel of them. Have a great day! Recently received my "Crafts n'Things" magazine and love the article. Great projects as always, Lisa. Way to go, what a great set of gifts to get published. Love the frame, I really need to do one of those. Awesome pieces. Congrats on your article.